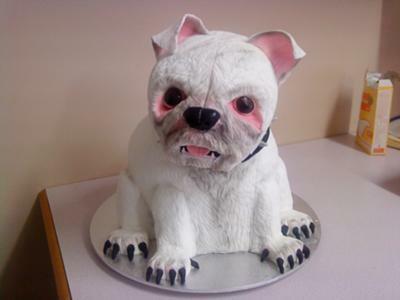 This dog cake was some work 5 days in the making and he turned out great. I cooked two 12 inch rounds and a Pyrex bowl cake as well. I cut all the leg shapes and added the feet made of fondant. The head is made from rice crispy treats if you have any more questions please send me a message. Thanks for looking! That is AWESOME! Fantastic job!!!!!! I especially love the ears....all of it is GREAT!